And now, back to Ursula in Hawaii. If you haven’t read the first couple of Hawaiian posts recently (or at all), you might want to do so now: Hawaii-Bound and Ursula’s Hawaiian Adventure. 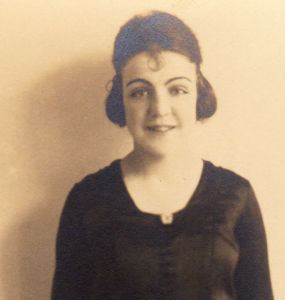 Previously on Mystery Dancer: In January 1928, Ursula and her good friend Elizabeth Everhardy sailed together for six days aboard a luxury cruise-liner from Los Angeles, California to Honolulu, Hawaii. 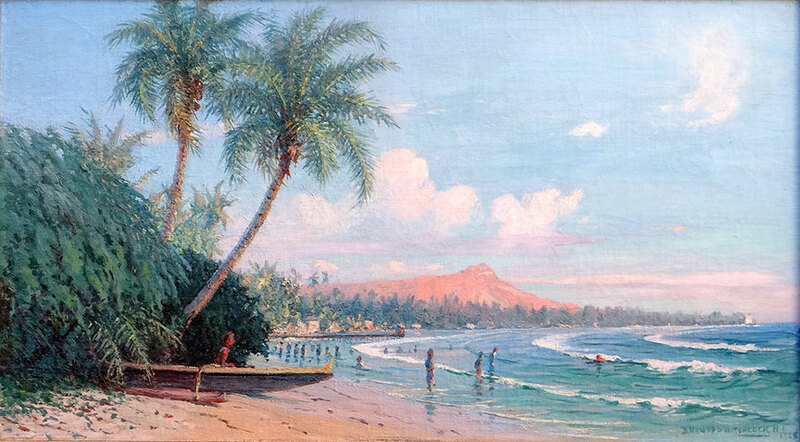 On the 20th of January, they and their fellow passengers stepped ashore on the Central Pacific Island of Oahu to a festive welcome: outrigger canoes and coin divers circling their ship, a throng of greeters festooning them with leis, and women dancing the hula to live Hawaiian music. This tourist brochure, published throughout the 1920s, guided Ursula and Clara through the Grand Canyon. When I first thought of writing about the photograph of Ursula and Clara at the Grand Canyon, I wasn’t sure how much I’d have to say about it. My excitement grew, however, after scanning the photo into my computer and zooming in on the piece of paper Clara held in her left hand. After rotating the image 180 degrees so I could read the text right side up, I made out the word “Drives,” with the letters “a-n-d” and some broken type above that. I thought the area obscured by her index finger might say “Trails and.” So, to Google I went. Eureka! I found a picture of a Grand Canyon tourist brochure entitled “Trails and Automobile Drives.” Its illustration and graphic design matched the one Clara held exactly. With a little more digging, I discovered some photos of the inside of this brochure, which the Fred Harvey Co. published nearly every year from at least 1923 to 1931. I was looking at and reading the same brochure that Clara and Ursula consulted on their southwestern adventure! It feels good to be back, focusing on and sharing Ursula’s life story once again. As noted in my previous post, before continuing with Ursula’s 1928 Hawaiian adventure, I’m going to backtrack to a trip she took with her mother, Clara, to the American Southwest. Ursula (left) and Clara Cheshire tour the Grand Canyon in 1926. Mystery Dancer is back! The past 25 months (yes, it’s been that long since my last post!) have been a blur. In addition to my day job as a freelance health care writer, I was honored to take part in an intensive eight-week artist entrepreneur program in Nashville. Then my father became ill and passed away, and in quick succession, so did a close relative of my husband’s. For some time I was also dealing with various health issues of my own—nothing too serious, but time-consuming nonetheless. Along in there, my husband and I became vendors at a delightful vintage shop nearby, and we traveled to Venice, Italy for our 10th anniversary. And poor Ursula got left by the wayside. Well, not too poor – we stranded her in Hawaii! I wouldn’t mind being stranded in Hawaii sometime. This is all to say that life is good and I am renewing my commitment to creative projects, including Mystery Dancer. I aim to post every Tuesday evening starting this coming week. There is lots more to the story! 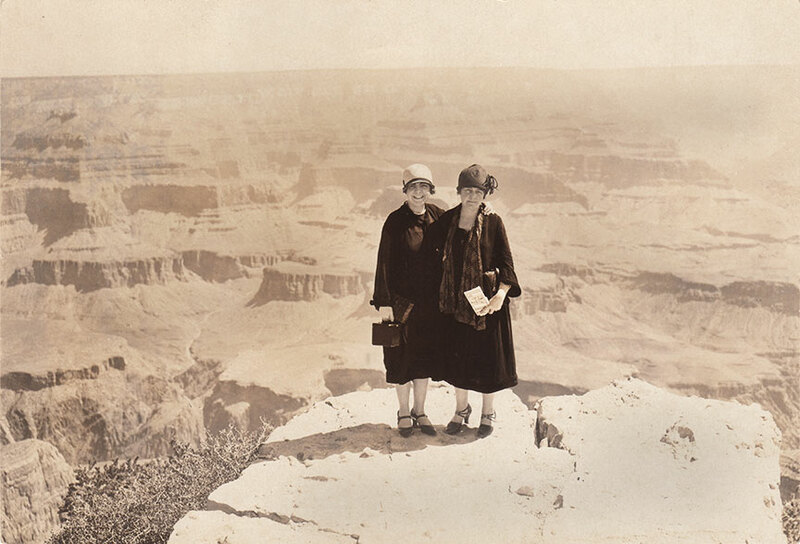 Before I continue with Ursula’s visit to Hawaii in 1928, I’m going to backtrack to a trip she took with her mother, Clara, to the Grand Canyon two years earlier. Stay tuned…And be sure to subscribe to Mystery Dancer so that you can receive an e-mail announcing the latest post. If you’re new to Mystery Dancer, welcome—the best place to start is at the beginning and go from there. One more note: You can now follow Mystery Dancer on Instagram. Woot!